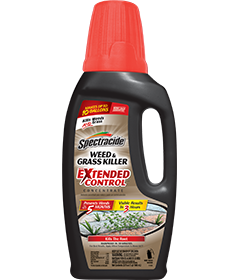 This product is a non-selective herbicide that will kill any vegetation contacted and will prevent weeds for up to 5 months*. It enters plants through the leaves and moves down to the roots. This will ensure that the entire plant is eliminated. It also provides a protective barrier that prevents weeds and grasses from emerging for up to three 5 months*. Avoid direct spray or drift onto desirable plants, lawn grasses, shrubs, and trees. Protect desirable plants and vegetation with a piece of plastic or cardboard. If desirable plants are accidentally sprayed, wash plants with water immediately. *Does not kill all seeds, woody and semi-woody plants, and propagules in the soil, such as tubers and rhizomes. Set sprayer to the “fl oz/gallon” level specified in the directions. 3 fl oz (6 Tbsp) per gallon of water treats 300 sq ft.
5 fl oz (10 Tbsp) per gallon of water treats 300 sq ft.
For best results and to prevent regrowth for up to three months: 7 fl oz (14 Tbsp) per gallon of water treats 300 sq ft.
Refilling the Spectracide® Weed & Grass Killer With Extended Control (ready-to-use container): Carefully measure and mix 7 fl oz (14 Tbsp) in 1 gal of water in the ready-to-use container. See the ready-to-use product label for complete directions. Completely cover the leaves of the target vegetation. Sprayed plants begin yellowing and wilting in as little as three hours, with complete kill, including the roots, in one to two weeks. Thoroughly cover treated areas to prevent new weeds and grasses from growing. For best results, apply during warm, sunny weather (above 60°F) when weeds are actively growing and no rain is forecast for 24 hours. Rainfall or watering 15 minutes after application will not wash away effectiveness. Do not mow, cut or otherwise disturb treated vegetation for at least seven days following application. Do not make more than two applications per year to any given area. Do not use on or around edible feed or food crops. Do not use in areas that are to be planted or seeded within three months. Do not use around newly planted trees, shrubs or flowers. WEED CONTROL: Use along fences, paths, patios, sidewalks, curbs and driveways and around established ornamental trees, shrubs, flower beds, plantings and buildings. Use for trimming and edging landscapes. 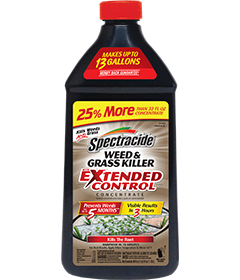 Do NOT use for spot weed treatment in lawns, since Spectracide® Weed & Grass Killer With Extended Control Concentrate kills all green plants, including lawn grasses. Set aside the soil removed from the hole. Place the plant in the hole according to the instructions on the plant. Fill the hole with planting soil or other untreated soil. Spread the soil removed from the hole in an area where no vegetation is desired. Pesticide Storage: Store this product in its original container in a secure storage area. Pesticide Disposal: If empty: Nonrefillable container. Do not reuse or refill this container. Place in trash or offer for recycling if available. WARNING. Causes skin irritation. Causes moderate eye irritation. Do not get on skin or on clothing. Avoid contact with eyes or clothing. Wash thoroughly with soap and water after handling and before eating, drinking, chewing gum or using tobacco. Hold eye open and rinse slowly and gently with water for 15-20 minutes. Remove contact lenses, if present, after the first 5 minutes, then continue rinsing eye. Call a Poison Control Center or doctor for treatment advice. Have the product container or label with you when calling a Poison Control Center, doctor, or going for treatment. This pesticide is toxic to aquatic invertebrates. To protect the environment, do not allow pesticide to enter or run off into storm drains, drainage ditches, gutters or surface waters. Applying this product in calm weather when rain is not predicted for the next 24 hours will help ensure that wind or rain does not blow or wash pesticide off the treatment area. Rinsing application equipment over the treated area will help avoid runoff to water bodies or drainage systems.